David Ricardo (April 18, 1772 – September 11, 1823), was a British economist, a successful businessman, financier, and speculator, and amassed a considerable fortune. He is credited with systematizing economics in the nineteenth century, and was one of the most influential of the classical economists. Despite his relatively short career, Ricardo's work in economics was foundational to many later developments in the field. Both those who favored his laissez-faire capitalism, and those who opposed it, drew on his work despite their abstract formulation. As a politician, albeit briefly, Ricardo was able to present his opinions regarding various issues, and his stature in the newly emerging field of economics caused them to be received with respect and acted upon. His promotion of free trade supported the growth of British industry. While Ricardo's theories have been modified and superseded, his foundational role in the development of economics remains, as does much of Britain's economic success and influence in the world during the nineteenth century. Born in London, 'David Ricardo was the third of 17 children in a Sephardic Jewish family (from Portugal) that emigrated from the Netherlands to England just prior to his birth. At age 14, Ricardo joined his father at the London Stock Exchange, where he began to learn about the workings of finance. This beginning set the stage for Ricardo's later success in the stock market and real estate. Ricardo rejected the orthodox Jewish beliefs of his family and eloped with a Quakeress, Priscilla Anne Wilkinson, when he was 21. He later became a Unitarian, and was disinherited by his family. It is likely that his mother never spoke to him again. Ricardo became interested in economics after reading Adam Smith's The Wealth of Nations in 1799 on a vacation to the English resort of Bath. His work with the stock exchange made Ricardo quite wealthy, which allowed him to retire from business in 1814 at the age of 42. He then purchased and moved to Gatcombe Park, an estate in Gloucestershire. In 1819, Ricardo purchased a seat in the British parliament as a representative of Portarlington, a borough in Ireland. He held the post until the year of his death in 1823. As a member of parliament, Ricardo advocated free trade and the repeal of the Corn Laws. Ricardo was a close friend of James Mill, who encouraged him in his political ambitions and writings about economics. Other notable friends included Jeremy Bentham and Thomas Robert Malthus, with whom Ricardo had a considerable debate (in correspondence) over such things as the role of land owners in society. He also was a member of London's intellectuals, later becoming a member of Malthus' Political Economy Club, and a member of the King of Clubs. He died at Gatcombe Park at 51 years-of-age. Ricardo first gained notice among economists over the "bullion controversy." In 1809 he wrote that England's inflation was the result of the Bank of England's propensity to issue excess bank notes. In short, Ricardo was an early believer in the quantity theory of money, or what is known today as monetarism. His law of rent was probably Ricardo's most notable and influential discovery. It was based on the observation that the differing fertility of land yielded unequal profits compared to the capital and labor applied to it. His other great contribution, the law of comparative cost, or comparative advantage, demonstrated the benefits of international specialization of the commodity composition of international trade. Ricardo formulate the "law of rent" around 1809. It was the first clear exposition of the source and magnitude of land rents, and is among the most important and firmly established principles of economics. The Law of Rent states that the rent of a land site is equal to the economic advantage obtained by using the site in its most productive use, relative to the advantage obtained by using marginal (the best rent-free) land for the same purpose, given the same inputs of labor and capital. To see how competition generates rent and, therefore, determines the magnitudes of the two remaining shares, we follow Ricardo's original logic. He began by noting that if land is not scarce, then it generates no rent. A given population requires a certain amount of food. The lowest quality land called into cultivation generates some profit (total revenue—wages). This profit becomes the prevailing profit through competition among farmers—any difference between the profit generated by higher quality land and the profit generated by the lowest quality land accrues to the landowner as rent. This law has a number of important implications, perhaps the most important being its implication for wages. The law of rent implies that wages bear no systematic relationship to the productivity of labor, and are instead determined solely by its productivity "on marginal land," as all production in excess of that amount will be appropriated by landowners in rent. The law of rent makes it clear that the landowner has no role in setting land rents: he simply appropriates the additional production his more advantageous site makes possible, compared to marginal sites. The law also implies that the landowner cannot pass on the burden of any cost such as land taxes to his tenants, as long as such costs do not affect the relative productivity of his land and marginal land. In his 1815 work, Essay on the Influence of a Low Price of Corn on the Profits of Stock, Ricardo articulated what came to be known as the "law of diminishing returns." One of the most famous laws of economics, it holds that as more and more resources are combined in production with a fixed resource—for example, as more labor and machinery are used on a fixed amount of land—the additions to output will diminish. Ricardo also opposed the protectionist Corn Laws, which restricted imports of wheat. In arguing for free trade, Ricardo formulated the idea of comparative costs, today called "comparative advantage." Comparative advantage, a very subtle idea, is the main basis for most economists' belief in free trade today. The idea is this: A country that trades for products that it can get at lower cost from another country is better off than if it had made the products at home. Analyzing this in more detail, the following table considers England and Portugal as producers of wheat and wine. It can be seen that Portugal can produce both wheat and wine more cheaply than England (it has an absolute advantage in both commodities). What David Ricardo saw was that it could still be mutually beneficial for both countries to specialize and trade. In Table 1, a unit of wine in England costs the same amount to produce as two units of wheat. Production of an extra unit of wine means foregoing production of two units of wheat—thus, the "opportunity cost" of a unit of wine is two units of wheat. In Portugal, a unit of wine costs one and a half units of wheat to produce—thus, the "opportunity cost" of a unit of wine is 1.5 units of wheat in Portugal. Because relative or comparative costs differ, it will still be mutually advantageous for both countries to trade, even though Portugal has an absolute advantage in both commodities. Portugal is relatively better at producing wine than wheat: so Portugal is said to have a comparative advantage in the production of wine. England is relatively better at producing wheat than wine: so England is said to have a comparative advantage in the production of wheat. When both countries specialize and trade their products, both countries gain. These gains come, Ricardo observed, because each country specializes in producing the goods for which its comparative cost is lower. Writing a century before Paul Samuelson and other modern economists popularized the use of equations, Ricardo is still esteemed for his uncanny ability to arrive at complex conclusions without any of the mathematical tools now deemed essential. As economist David Friedman (1992) put it in his textbook, Price Theory, "The modern economist reading Ricardo's Principles feels rather as a member of one of the Mount Everest expeditions would feel if, arriving at the top of the mountain, he encountered a hiker clad in T-shirt and tennis shoes." the difference between the amount produced by a given quantity of labor at the margin and the wages of that labor determines profit. taxes on profits will be paid by the consumer, and taxes on wages by the capitalist. the medium of exchange is distributed so as to bring trade to the condition it would be in if it were conducted by barter. Ricardo’s approach to economics differed markedly from that of Adam Smith. Ricardo was a pure theoretician, an architect of a simple, highly abstract model from which he drew policy conclusions. His most important assumption was that economic growth must decline and end due to the scarcity of land and its falling marginal productivity. In this, we see the origin of John Stuart Mill’s later contention that economic stagnation would flow from the working out of the capitalist productive process. It also is very suggestive of later arguments by John Maynard Keynes of the continuing potential macro-stagnation that, according to Keynes and many of his followers, flows from a chronic insufficiency of aggregate demand in any relatively closed-market economy. Ricardo’s foremost contemporary critic was Malthus, author of the famous pamphlet An Essay on the Principle of Population. It was from Malthus that Ricardo took the argument of an ever-growing population that pressed against all economic expansions, an assumption that lay at the heart of Ricardo’s model. His central consideration in his Principles was to show how distributional changes between wages, rent, interest, and profit affected the prospects for long-run capital accumulation and economic growth. Because his model produced a falling rate of profit and an ever-rising price for corn (grains), Ricardo favored an end to the Corn Laws, arguing that Britain ought to import corn from countries better equipped to produce it at lower cost. He was opposed to the rising rents he attributed to the laws, since they came, in his view, at the expense of the driving force of the economy—profits (Formaini 2000). Ricardo’s theory of rent was tied directly to the marginal productivity of land, his theory of value was tied directly to labor costs, and his theory of distribution stood atop both concepts, with Malthusian economic stagnation as a major assumption. Ricardo was not as naive as to attempt to explain all market prices by labor costs. He recognized the importance of “non-reproducible” commodities whose value was solely determined by their rarity in the market. However, he considered such things as rare paintings and fine wines to be a small portion of overall market consumption. He also allowed a role for capital in determining value and argued that an increase in fixed (more permanent) capital as opposed to circulating (perishable) capital would increase value. By allowing value to be influenced by capital, Ricardo indirectly suggested that time played a major role in value, a discovery later generally attributed to other economists (Formaini 2000). Another major contribution Ricardo made to economics was the doctrine of fiscal equivalence, or, as it has come to be known today, Ricardian equivalence. His argument, as put forth in Chapter 17 of his Principles is as follows: It matters not whether government finances itself through taxes or debt. They are equivalent and have no appreciable effect on household consumption or capital formation. This is because either the public sector will save or run a deficit, or households will do likewise and at the same rate. Further, expectantly, taxpayers view a deficit as a future tax increase and will save to pay for it, while a surplus is viewed as a future tax cut with an opposite result (Formaini 2000). Ricardo’s international free trade agenda became one with British public policy. Ricardo had provided an answer to Britain’s long-term growth problems, and Britain became the “workshop of the world,” importing most of its food and “outsourcing” most of its agricultural employment. Ricardo’s ideas became “the fountainhead of all nineteenth-century free trade doctrine!” (Formaini 2000). Ricardo’s abstract model became the means by which he advocated public policy. A free trade enthusiast, he also was not a fan of public expenditure, believing most such spending to be at worst wasteful or at best incapable of changing aggregate well-being and output. 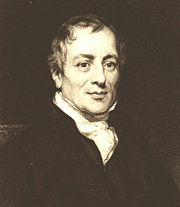 Ricardo also believed that the Corn Laws, in particular, constituted a burden to the agricultural economy. He believed that these trade barriers kept food prices artificially high and encouraged a bloated rent rate. In Parliament, Ricardo actively campaigned against the Corn Laws as well as other government interventions. Essentially this economic stance mirrored Adam Smith's teachings: the market, although imperfect, is best left untouched. Government action only prevents the economy from righting itself. Although Ricardo did not share Smith's complete confidence in the market he recognized that tampering with the system would only result in further economic stagnation. Ricardo's influence, especially in Great Britain, was great. As Keynes wrote, “Ricardo conquered England as completely as the Holy Inquisition conquered Spain” (Formaini 2000). Ricardo also maintained that England's inflation was the result of the Bank of England's propensity to issue excess bank notes. Thus, Ricardo was an early believer in the quantity theory of money, or what became known as monetarism. Ricardo, D. 1810. The High Price of Bullion, a Proof of the Depreciation of Bank Notes. Ricardo, D. 1815. Essay on the Influence of a Low Price of Corn on the Profits of Stock. ↑ Henry George extended the Law of Rent by recognizing that marginal productivity of labor on intramarginal land (the "intensive" marginal product) would equalize the "extensive" productivity of labor on marginal land: "the process will not stop until, either by the extension of cultivation to inferior lands or to inferior points on the same land, or by an increase in the relative value of manufactured products ... the yield to labor and capital [has] been brought again to the same level. ... And thus to say that rent will be the excess in productiveness over the yield at the margin or lowest point of cultivation is the same thing as to say that it will be the excess of produce over what the same amount of labor and capital obtains in the least remunerative occupation." Case, Karl E. and Ray C. Fair. 1999. Principles of Economics (5th edition). Prentice-Hall. ISBN 0139619054. Formaini, R. L. 2000. "David Ricardo: Theory of Free International Trade." Economic Insights. Dallas, TX: Federal Reserve Bank of Dallas. Hollander, Samuel. 1979. The Economics of David Ricardo. Toronto: University of Toronto Press. On the Principles of Political Economy and Taxation – by David Ricardo. Complete, fully-searchable text at the Library of Economics and Liberty. This page was last modified on 10 November 2017, at 22:43.